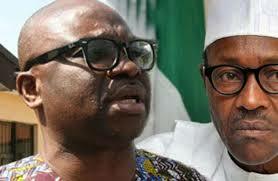 The Ekiti State Governor, Mr Ayodele Fayose has advised President Muhammadu Buhari to resign if he has no clue to solving the dwindling economic fortunes and the high level of poverty in the nation. Fayose, who advised Buhari to also fulfill the three million jobs annually, he promised during the electioneering campaign, added that it would be unfair to this government to sack anybody under any guise or fail to resolve all issues affecting the populace, having promised that he has the magic wand to turn the country around. The governor accused president Buhari of double standard for proposing to remove the subsidy and jack up the pump price to N97, saying, “this is not the change Nigerians voted for. President Buhari must fulfill all his electoral promises to the people. Enough of these flimsy excuses”, he said. The governor spoke yesterday while signing into law, the sum of N67.04 billion 2016 Appropriation Bill he presented to the House last Tuesday, among other five bills that had been passed by the house. Others bills assented to include: Ekiti State Regency Bill, Ekiti State 2015 Revised Appropriation Bill, Ekiti State College of Technical and Commercial Agriculture Repeal Bill, Ekiti State Office of the Defenders Bill and Kidnap and Terrorism Prohibition Bill 2016. Fayose, who rapped Buhari for running what he described as “a rudderless government said: “What we have under change promised by APC is dwindling economy, low power generation, proposed subsidy removal, high level poverty and naira devaluation. “Even for the President to have said Nigerians should brace up for more hardship in 2016 is most callous of a man who promised Nigerians change. “President Buhari must stop fighting from all fronts. This political vendetta will take him nowhere. If he thinks he can’t solve all these problems, he should handover to Vice President Yemi Osinbajo or whoever and bow out honourably”.